For weeks hundreds of residents of Garni, a large village situated some 30 kilometers to the east of capital Yerevan, staged protests, including the blocking of a highway leading to one of Armenia’s most popular tourist attractions, a pagan temple built in the 1st century A.D., against a World Bank-financed project under which some of the water of the Azat river that flows through the Garni Gorge would be diverted for the purpose of irrigating a dozen communities in the Ararat province of Armenia. Remarkably, the extended family of Prime Minister Hovik Abrahamyan is also known to own land in the beneficiary communities. Many villagers in Garni claim the project, which, if implemented, would admittedly leave them without the bulk of drinking and irrigation water, was primarily designed to further the business interests of officials and their families. The government, however, has denied any ulterior reasons, saying that the goal of the projects is to reduce water-pumping costs. When the Garni villagers made their last-ditch attempt to get the project cancelled by blocking the highway passing through their community on Saturday, Prime Minister Abrahamyan visited them and after conversations with villagers declared that the gravity irrigation system project would be terminated and the machinery would be withdrawn from the gorge. He added, however, that discussions will continue about another project, which involves the use of Geghardalich reservoir water for the gravity irrigation of a number of communities in the Kotayk region. The protesters were not completely satisfied with this decision, saying that they will also continue to fight for the “liberation” of the Azat River and for defending Geghardalich. “We have heard a lot of threats, they would try to create an atmosphere of fear so they could do whatever they wanted, but we understand all too well what is going to happen if the project is implemented,” says 46-year-old Garni resident Vahan Mkrtchyan, who adds that even now they have problems with irrigating their land-plots, the main source of their incomes. Mkrtchyan says they are determined not to allow the resumption of the project and will “start a war” if the government goes back on its promise. He believes it was due to their consistent struggle that the government decided to step back. “These authorities have become so impudent that they would even do such a thing after the [April] war [in Karabakh]. During those days when they saw that all people were concerned about Karabakh, they rushed to do their dirty work and deployed the machinery. These authorities must be reminded everyday that people live here,” he adds. The Garni success is the latest in a series of civil society victories in Armenia in recent years that include successful protests against controversial government plans for Trchkan Waterfalls, the Teghut forests, Mashtots Park in Yerevan and others. Garni’s Mkrtchyan links their success to the burgeoning civil society in Armenia, too. “Did you see that last summer when people took to the streets to protest against the rise in electricity tariffs, they also decided that there would be no rise? That’s how it’s done in this country, you have to protest all the time,” he says. 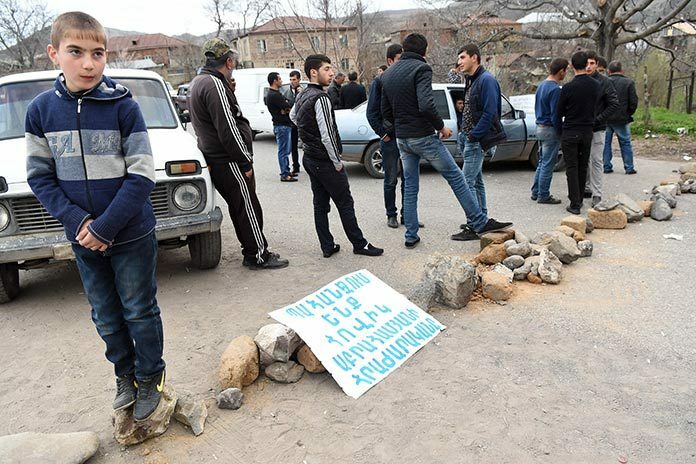 While the patriarchal way of life where men dominate in virtually everything is particularly strong in rural communities in Armenia, the Garni protests showed that there are also quite a few female activists in the village who were in the first rows of the protesters. One of the most active protesters, Arusyak Ayvazyan, even contacted the World Bank office in Yerevan and talked via Skype with representatives of the head office in Washington, explaining to them that they had been wrongly told that people in Garni were not against the project. She says to this testify the 2,300 signatures collected against the project that were submitted to the president of Armenia recently.